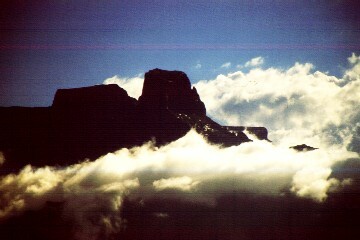 The highlight of this visit was the Drakensberg Mountains. 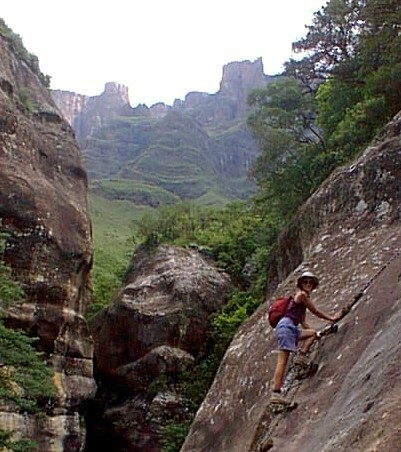 The Royal Natal National Park in particular with its fun 'gorge' walk. We particularly enjoyed getting involved in rescuing cas out of the mud too! After fast and relatively efficient (they stamped Andrews passport with an exit stamp) border formalities we were off into the rain to find somewhere to camp. We decided to take country roads instead of main ones as there is more to look at. So much for thinking that the bottom of the mountain would be warm, sunny and dry. As the journey progressed so did the rain. It just got harder and harder. Numerous soaking children flagged us down to tell us that the bridges were impassable. Believing that they were after a few rands as a reward for saving us any inconvenience we said "thanks, but we will go and see". Good move, the roads and bridges were fine and the route very interesting. The Glengarry Park near the entrance to Highmoor National Park was a delightful campsite. 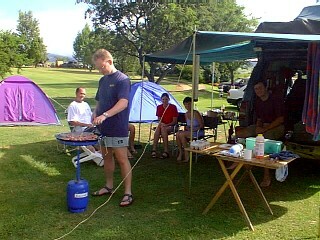 As it was outside the national park then camping fees were reduced. Given the rain we had to cook inside the car which is not the easiest of ventures but we are very lucky to have that option when the rain is pouring. 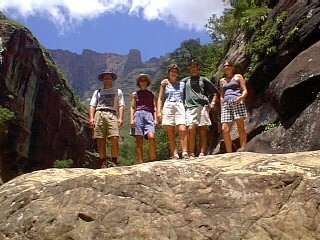 After a few chores in the morning we left Glengarry to continue north to the Royal Natal National Park in the northern Drakensberg where we were due to meet Kevin, Rhoda, Karen and her friends that afternoon. The sun came out and we hoped for a beautiful weekend for our hiking expedition. En route to the park we drove past black townships where the houses are rundown, the fields are untidy, schools are in a poor state, animals run freely in the road and the only cars around are rusty broken down ones. Then a town appeared where the houses are beautiful, gardens are well kept, the schools are in good order and all the locals are white. The contrast was quite alarming. The black/white situation out here is very complex and it is still early days in this post-apartheid era. For a person from Britain, such obvious differences are not easy to come to terms with. At the 'berg we had an afternoon of sitting around and entertaining the children before the arrival of Karen and her friends, Linda and Paul. That evening we had stir fry cooked on a "scottle" which is a giant flattish wok attached by a long pole to a gas canister. Great invention for camping. Rhoda cooked us all eggs and bacon in the morning - a hearty breakfast in preparation for a long hike on "The Gorge" route. Rhoda stayed behind with the children while us intrepid explorers set off for a day of walking, swimming and sightseeing. The Drakensberg is so beautiful and our walk took us along a path through the gorge where we were able to pass through very dense moist areas with little streams alternating with open areas with flowers and views of the 'berg. Andrew led the way first and took us on a march but the puffing and panting was eased during a few rehydration stops. At one point in the gorge (after about two hours of walking) you have to make a decision. 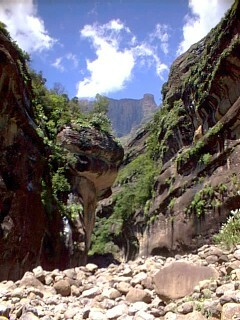 To go beyond that point you have to wade through freezing mountain water, or take the vertical ladder up the side of the gorge. We took the water option. Talk about brass monkeys - blimey it was cold. 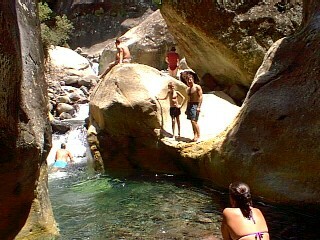 The river has carved a beautiful pool into the rock and you have to walk into the pool to hip level before you can climb out. Then we all jumped in and went for a swim. Complete madness. I have never seen such clear riverwater. It was absolutely beautiful. After some lunch three of the crowd turned back whilst Kevin, Andrew and I continued. There was apparently another 800 m of the route to go which involved a) finding the route and b) crossing the river many times using stepping stones. We did find the route and the stepping stone business was good fun. 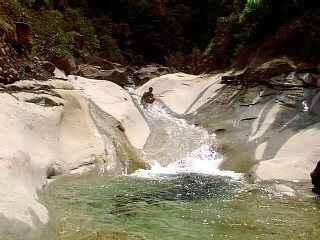 Eventually we came to another pool, this time with a slide created by the water flow. 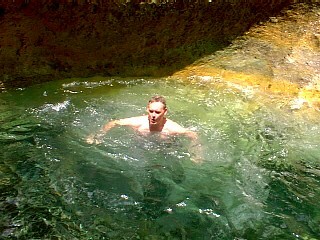 Sadly the water had not carved out a very smooth slide and a bit of suffering was to follow. Andrew had decided to skinny dip and the result of the slide was a very sore graze on his left cheek. Kevin managed to tear his trunks. The water was beautiful and as we were quite high up in the gorge decided to fill our water bottles directly from the stream. The water is safe enough to drink and we hoped there wasn't a dead nasty upriver. Instead of taking the water route back we decided to take the ladder route. After the challenge of finding it the first section involves holding onto some wire while you walk your way down a very acute angled slope. The latter half involved descending using a ladder - the easy bit. The next two hours or so down the mountain was pretty painful. Oh, the feet were so sore. What a delight to get back to the camp, to take off the boots and cool the soles of the feet on the shady patches of grass. Linda had made some delicious muffins and chocolate crunchies which worked a treat in cheering up the tired bodies. 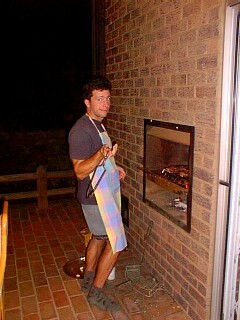 That night we all had a delicious braai. Sunday 6th was a day of indulgence, after all, this was our ten month travelling anniversary. After a morning in the hammocks we had to say a sad farewell to the others who were returning home at the end of their weekend away. In the morning we just about managed to pack up before the rain started. We had made a decision to go to Joburg for the convenience of facilities. We had a lot of catching up to do with administrative matters - after ten months there were things to be done. The weather forecast was also bad - more rain was due. Four hours of rain later we reached Joburg and the camping option was not on the agenda. Fortunately Ritz Backpackers had a place for us. The delightful thing about the Ritz is that it is five minutes walk to the cinema and with great excitement we headed off to the flicks. The next day we located the House and Home Sitting Agency which places "house sitters" into houses requiring looking after while the owners are away on holiday. It is a fantastic idea and for a nominal fee (23 rand) per night you have the luxury of home comforts as well as the responsibility of caring for dogs, pools and anything else that is necessary. For the home owners they get their houses watched and, more importantly, their pets cared for. We were told that this was a quite time but we didn't have to wait long as a phone call the next day asked us to go and meet a family. Michelle and Graham had recently been burgled and wanted someone to care for their things while they were away. They were due to fly, by light aircraft, onto the Port St Johns runway up on the mountain that we had driven on a few weeks ago. That runway covered in cows and pats was not disused, after all. The household responsibilities were minimal which was good for our first sit but the highlight was to be two beautiful alsations that were to be ours for the week. Talk about indulging humans - Shep and Sasha were an absolute delight. The week went by very quickly and having a base with a big table, telephone, lots of pans and a flush toilet nearby was luxury indeed. We were able to spread out our things and do some planning and eat some good food - like ice cream which we could buy because there was a freezer. 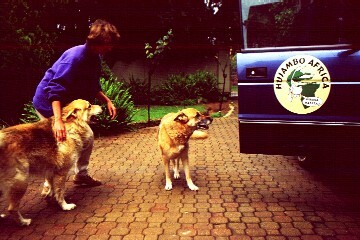 The dogs were a constant source of amusement and we just couldn't give them enough cuddles. The house had a swimming pool which we couldn't use because the pump was broken and the algae building up. It didn't make any difference though because it rained for seven days out of nine. The weather has been atrocious and people speak of never having seen anything like it before. It was worse than in England. 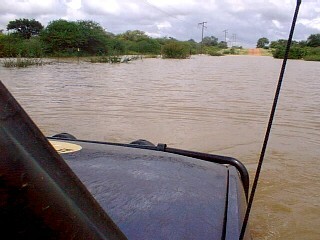 Radio and newspapers reported floods in southern Mozambique, Botswana and around the Northern Province of SA. Roads and bridges were washed out, thousands of homes had disappeared and up to sixty people had died. Kruger National Park was swimming and people had to be airlifted out. HazyView, where we had stayed a few weeks ago was also suffering severely. This is just what you don't expect in summer and we wondered how Gordon, Sally and Noel were getting on. Cholera and typhoid were predicted. The fuel crisis in Zimbabwe was getting worse. Apparently petrol was limited to three to five litres per fill and no diesel was available. President Mugabe of Zim had recently won a national draw (!) but lost his proposed constitution change which would keep him in power indefinitely and remove the farms from the whites (with no payment) and give the land back to the blacks. This would have serious consequences for exports, particularly tobacco. Thankfully the people of Zimbabwe voted 'no' and after twenty years of hardship (constantly blamed as being the result of colonialism) are ready for a change. The elections in April will be very interesting indeed. Having some "normal" living for a couple of weeks gave us an opportunity to see how things actually work in Joburg. I cannot say that I am greatly impressed with the general level of efficiency and organisation. Workmen don't turn up when they say they will and when they do show up they do shoddy work and leave the job unfinished. The directory enquiries system is the worst ever and you cannot get the information you require. When lightening strikes the power goes off for an indefinite period. Public transportation is more unreliable than London buses. However, the roads are good and the shopping centres excellent despite the carpark height restriction of 2.2m. Punda does not fit. On the 12th the bug that I had a few weeks ago returned, but this time with the added barfing bonus. Wishing to knock it on the head quickly I went down to the medical centre for a bit of advice. I wanted to know what was causing it. A consultation, blood test, a stack of antibiotics and other medications and an anti-sickness jab in the bottom set us back a hundred quid which would be worth it if I could find out what the cause was. The jab meant that I could down a bacon butty which was a real treat as I was so hungry. Monday 14th and we nipped over to Sandton City to get a few bits when we discovered that an orchestra was playing in the square that evening. Not wanting to miss a concert we took our seats at a square-side restaurant for a cuppa. Four hours later we were still there. No-one seemed to mind or were bothered that we had only bought a few drinks and had a starter and pudding between us. That was very naughty of us but guaranteed good seats for the night. The concert was excellent and its setting in a square surrounded by trees, restaurants and twinkling fairy lights was delightful. After pancakes on the 15th (we guessed that could be pancake day) we were down to more planning and decided that we'd like to make a trip up to Malawi. 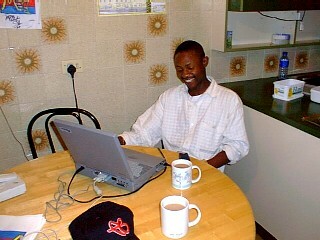 You can reach Malawi via Namibia (Caprivi), Zambia, Mozambique and Zimbabwe, but not directly from SA. However, the political situation in Caprivi, the necessity to buy a visa for Zambia, the floods in southern Mozambique and the lack of diesel in Zim reduced our options somewhat. Punda was treated to a couple of new tyres. I didn't think the old ones looked too bad until I compared them to the new ones. For five minutes I stared in amazement at the difference in tread depth. There was more tread on my flip flops. Punda would now be 3cm taller and have even more difficulty getting into car parks. The 19th came around far too quickly and it was time to leave our temporary home and our temporary pets. We headed off to Debs' house in Constantia Kloof. She had kindly offered to put us up until the new tenants arrived. 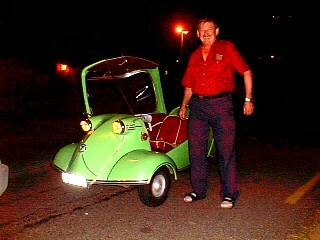 On the way we towed a Messerschmitt that had broken down at the lights, or robots as they call them here. What a car - great fun. It had probably refused to budge in protest to its drivers breath. Drinking and driving is rife in this country. Other road users were in a safer position with Punda towing and that car had probably never been as fast in its life. Our first task at Debs was to pretend to be the new tenants and do the dirty deed of kicking out the previous maid who refused to budge despite having no legal right to be in the house. Not a nice task but it worked. The next day the telephones died and in true African fashion would take 2-3 days to fix - not good for a place that is likely to be the most advanced city in Africa. Meanwhile, the results of the bug tests all came back negative! Over the next few days we used Debs house as a base to sort out some jobs and to help Deborah pack her things away. We became quite attached to a puppy that had been left behind by the maid. It was a skinny little thing having not been fed very well but he had a beautiful temperament and such a personality. What an adorable chap. 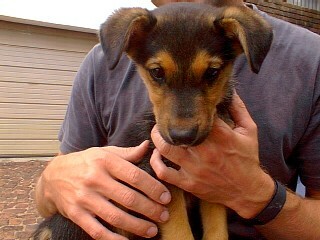 He was of uncertain parentage so we called him "Scrabble" (a bit of a mixed bag). When it became time to continue with the travels we almost took Scrabble too but the UK quarantine laws helped us to see the sensible side of the situation. 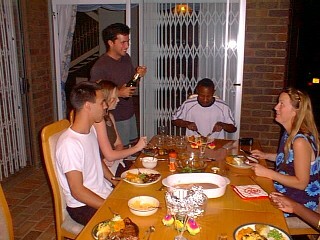 The night before we left, Debs treated us to a beautiful steak dinner on the braai. Back on the road and heading north towards Zimbabwe for the third time and it wasn't long before the rain started. Just past Louis Trichardt we were diverted because part of the road ahead had collapsed. It was getting dark and our detour to Messina would delay us by a long time. It is never good driving in the dark. About an hour into the detour we came across the first mass of carnage. Cars were everywhere stuck in the mud trying to get past a lorry which was seriously anchored into the ground. Punda to the rescue! Everyones face lit up as we charged forth attacking the ruts with gusto - until we came to a halt as we crossed two very deep ruts. Then the faces dropped - including that of the chap in the rescue vehicle who had been summoned to help. However, we had approached the ruts at an angle so we only ever had one wheel down a rut at a time and with the limited slip diffs engaged we literally popped out of the hole. Hurry for Punda - we were staggered and couldn't pat the car enough. Over the next four hours we rescued ten cars, towing them out of mud and through water. We were heroes for the night. It was so satisfying being able to help the locals - particularly the black people who tended to have old cars, no spares and a pile of small children huddled in the back seat. They were unbelievably grateful. We have found that time and assistance is much more valuable and rewarding than the thought of handing out cash or gifts. I was constantly surprised how the white population responded though. There tended to be quite a lot of arrogance and an expectation that we should help. Most had good cars but none had spares. It was amazing. One got a puncture and had no spare wheel! We had to get our high lift jack out, take the tyre off and fix it otherwise she would have been absolutely helpless. Others buzzed off once we had assisted them but soon returned when they realised they needed help to get through some fast flowing water further along the road. They got a bit wet, but "shame man" as they say in SA! We wished we had our union flag flying but we made a point of telling everyone we were British. What would have been a laugh though would have been to have had a bugle to sound the arrival of the English (recently saw 'Anna and the King' at the cinema). With a sigh of relief we reached Messina at 2am only to find a small bridge 10km before the border was too weak to carry any traffic. No-one was allowed through so everyone camped at the side of the road. At 5.30 we were up again as the lorries were getting anxious and the noise level escalating. During the night the bridge had collapsed and it was anticipated that it would take three days to build an alternative route. This was the only direct route into Zim from SA so we decided to head towards some of the border points with Botswana and get into Zim from there. Ha, ha, not a hope! A half days investigation revealed not only bridges out but the water level was so high it was entering the houses. Our next move would be to head further south and find a dry crossing point. Well, a further half day in the mud didn't get us very far and we towed a few more people through water. 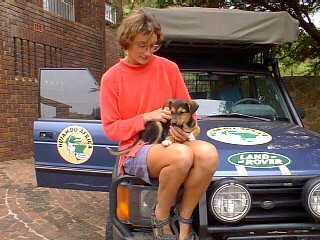 We thought we were well on our way to Pietersburg when we came across parked cars and people walking around aimlessly. A bit of water was blocking the road, but it was difficult to see how much because it was dark by this point. Some people had pushed a Toyota through and three lorries were sitting at angles having gone off the road and got stuck. I was ready to get the tent out. Andrew had other plans! "I'm just going for a look" he said as I was washing up in the back. Humm indeed. It wasn't long before I could have opened the window and just washed the dishes in the water as we went along. Very soon we had no lights as the two headlamps and spotlights were submerged in the murky water. (Top tip - mount spotlights on the roof rack). Andrew had to shine a torch out of the window to see where we were going. Fortunately we had the stranded lorries as a guide as to where the road edges were and some chap on the other side put his headlights on which we could use as our North Star. It was when the water came over the bonnet that it started to get interesting. The glug glug of water going down the ventilation system broke the silence and within seconds my flip flops started floating in the passenger footwell. We hoped it wasn't going to get any deeper because soon we would have to shine the torch out of the sunroof as there wasn't enough window up to keep the water out. It was too late to turn around so we had to keep going. Half a kilometre and five minutes later we were able to breathe again and our adventure was over. The only visible damage was wet carpets and headlamps that needed draining. Punda 'the fish' got us through. 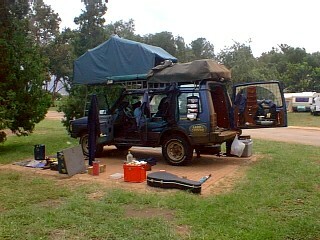 The campsite at Pietersburg was great for drying off everything, including the stereo which had stopped working. At some point during the swimming pool escapade two brake pads fell off! A complete mystery. By late afternoon the next day we were ready for the road again and started our journey south to one of the Botswana borders. Within an hour a radio bulletin (dried the stereo) said that the Beitbridge border was open so we did a swift U-turn and with a yeehaa headed north. 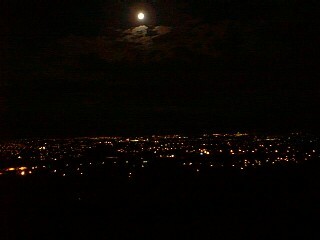 Another interesting evening followed as we tried to find a route north. There were bridges out everywhere and we doubled the distance in detours. The Sand River had created absolute devastation. It was really interesting to be involved in this disaster to appreciate the effect it has on people and to see how the emergency services cope with it all. I was very impressed with the South African services. Eventually we found half a bridge standing and braved a crossing. Fortunately, Punda was skinnier than it and at 1am, having towed a chap out of the mud on the same road as the previous adventures (and said hello again to the stranded truck driver in his half buried lorry) we arrived in Beitbridge. The radio had lied - the border was still shut. We went into town to fill up the tank and jerry cans with fuel (diesel shortage in Zim) and assisted some locals who had broken down. In fact, they had no starter motor and needed a tow start. We gave them a tow and once they had got started the driver slammed on his brakes and snapped our strop - our faithful old strop that had got many out of difficulties. We didn't expect to get a replacement or payment for it because we knew we had no hope. We did expect a sincere apology. What we got was a "durr, ohhhh". I was so mad I could have wrapped what was left of the strop around his neck and taken him for a tow start. At 2am we were back at the roadside camping and by 6.30am were in the convoy of cars making our way through a new route which had been bulldozed through the trees and over an unused, but still standing bridge. Unfortunately the lorries faced a few more days of waiting before they too could get out of South Africa. Beitbridge was incredible. 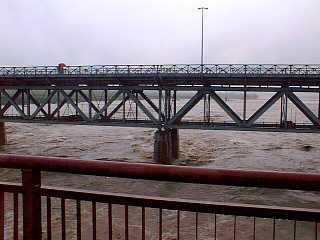 Normally the river is a trickle about 30 metres below the bridge. Today it was a lake about 8 metres below. A few days earlier the water level was just under the bridge. It is staggering to believe that a river can rise almost 30 metres (9 floors)!